Before I married my husband I was not a coffee drinker at all. I thought it was all the same and well nasty tasting unless it had a pound of sugar in it to kill bad taste. Now that I've been educated so to speak that not all coffee brands or roasts are alike I know that not all coffee is nasty. I also learned that whole bean gives you a totally different flavor too as opposed to already ground coffee. So when I got the chance to check out the Dancing Moon Coffee Company brand I was pretty excited. It was actually my first experience with grinding coffee all by myself with no help! Usually that's a task I would push off onto my husband. But since this was sent special for me I decided to give it a shot. I am happy to report that neither one of us spit out our first sip of the coffee I made. I don't know if grinding beans is something you can do right or wrong, but I am just happy to say the coffee I made was pretty darn good. So good I finished over half the pot myself. One part I really like about the Dancing Moon Coffee brand is that a portion of the proceeds of every sale goes to the Semper Fi Fund, set up post – 9/11 to provide immediate financial assistance and lifetime support for the wounded, critically ill and injured members of the U.S. Armed Forces and their families. I always like to support companies that give back when I'm doing my shopping. Proper roasting is one of the keys to great-tasting coffee. Too lightly roasted, and the coffee will have a lackluster flavor. Too heavily roasted, and the flavor of the roast will begin to overtake the flavor of the coffee. In order to maximize flavor, each coffee variety must be roasted to the exact point where Origin Flavor is in perfect balance with Roast Flavor. That’s why you’ll notice that each of our coffees look slightly different -- some are roasted darker or lighter than others. We believe that this is the only way to treat a Legendary Coffee. One taste of a Dancing Moon Coffee, and we think you’ll agree. All Dancing Moon Coffees are naturally high in antioxidants. And our special roasting process activates even more of these powerful antioxidants. So just one delicious cup of Dancing Moon Coffee gives you three times more antioxidants than a cup of green tea. 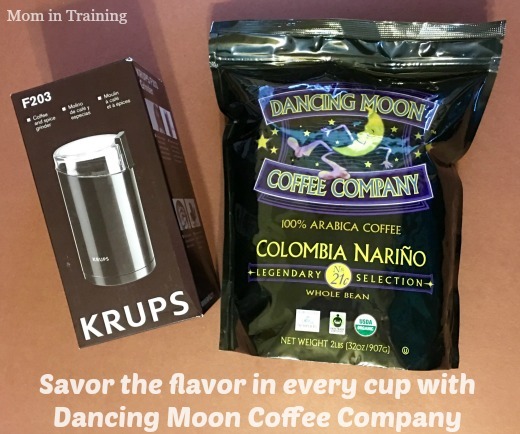 All Dancing Moon coffee is grown organically without harmful agrochemicals in favor of environmentally sustainable farming methods that protect farmers' health and preserve valuable ecosystems. Buy it: You can purchase Dancing Moon Coffee on Amazon.